Adobe has been making their “creative suite” for years, and while it is robust on so many levels, it is also daunting on just as many. There’s so much to learn and wrapping your head around each component is key in order to get the most out of each of them. Our latest Cult of Mac Deals offer will give you a chance to get the most out of Adobe Creative Suite 6 so that you can get more results from your creative work. The Adobe CS6 Training Bundle offers over $891 worth of education on Adobe Creative Suite 6 – with over 1000 lessons making up over 100 hours of practical training – and Cult of Mac Deals has it available for only $99 for a limited time! Adobe Photoshop CS6 Video Course: Let’s face it, Adobe Photoshop is so intense that unless you’re a pro there’s a good chance it’s consuming up way more time of yours than it should be. With this easy to follow video course you’ll have the most comprehensive learning resource on Photoshop CS6 available. Adobe Illustrator CS6 Beginner Course: Designed for professionals around the world, Illustrator can be a mystifying program. This course breaks it down into easy-to-understand sections that even an absolute beginner can understand. Adobe InDesign CS6 Master Class: This video course has the range to teach InDesign beginners the basics and enlighten advance users to expert tips and tricks that will super charge your abilities. Adobe Dreamweaver CS6 Course: Whether you are new to Dreamweaver, or have used it before, in this course you’ll learn how to get the most out of Dreamweaver so that you can create amazing web pages! Adobe After Effects CS6 Course: In this training course you’ll be introduced to this powerful, non-linear visual effects software from Adobe. This tutorial is designed for the beginner, with no previous experience in After Effects required. Adobe Premiere Pro CS6 Course: In this training course for Adobe Premiere CS6 you’ll be introduced to the powerful tools that are available to you in this video editing software from Adobe. Designed for the beginner, this tutorial begins with the basics, and gradually teaches you everything you need to do to create high-quality video projects. Adobe Flash CS6 Course: In this training course for Adobe Flash CS6, you will be introduced to Flash, and you’ll learn how you can use it for your design projects. Learn To Conquer Encore CS6: This Adobe Encore CS6 training course teaches you how to create top quality DVD and Blue-ray discs using this popular software from Adobe.This video course is designed for the beginner, and no prior experience is assumed. Adobe Audition CS6 The Easy Way: In this training course you will be led through the use of this professional grade audio-editing software from Adobe.This video training course is designed for beginners with as little as no previous Audition experience, but still provides useful tips and tricks for advanced users as well. 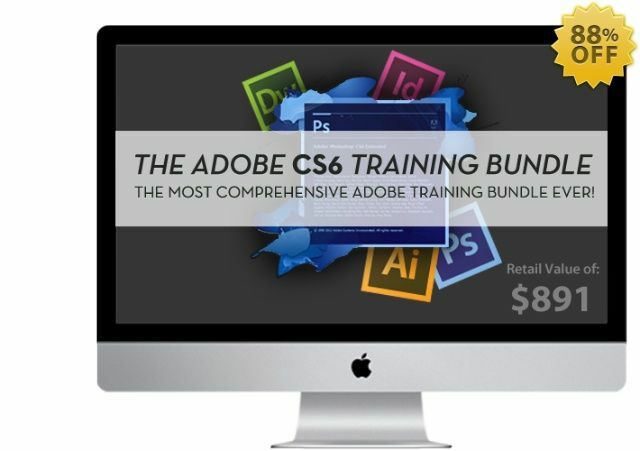 The Adobe CS6 Training Bundle is the most comprehensive training package available for those trying to make the most out of this suite of Adobe products. It covers such a wide range of creative work that at this price – an unbelievable 88% off the regular price – it’s worth every penny. But this deal won’t last long. Grab The Adobe CS6 Training Bundle for just $99 – and start making the most of this essential creative suite now! Want More Freebies And Deals On Mac Software And Apple Gear? Sign Up Below!